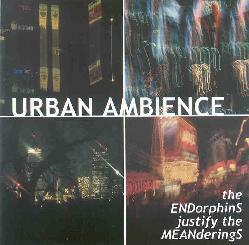 Urban Ambience - "Exiles In Limbo" / "The ENDorphinS Justify The MEANderingS"
Urban Ambience is a Boston based trio that have been recording together since 1987. The band consists of Michael Bloom (ex-Cul de Sac) on guitar, bass, electric marimba, percussion and keyboards, Chuck Rosina on tapes, FX, found sounds, keyboards and voice, and Bob McCloskey on saxophones, flute, keyboards, percussion and voice. I'm hard pressed to summarize the Urban Ambience sound as they cover a lot of ground, but what I mostly hear is a blend of 80's DIY tape experimentalism, Residents/Vas Deferens Organization styled craziness, ambience, spaced out grooves, and jazz influences. If that all sounds like a recipe for chaos I can assure you that.... it is! BUT... it's a creative, controlled, and carefully considered chaos that makes for some fascinating explorations into music and pure sound. Exiles In Limbo includes tracks that were new at the time as well as tracks compiled from earlier releases. The disc opens with "Shinkansen Shuffle". The music is jazz based, but in a quirky Gong meets Shadowfax style. The music rolls along with a nice groove backed by the sound of a train bustling down the tracks and sparse bits of electro wind rushes and little freaky bits. The urban and the ambience? "Tuvans To Go" opens with a chorus of throbbing didgeridoo, sax, and Tuvan throat chants. Soon a huge pulsating wall of drone bubbles to the surface and serves as the foundation upon which a chaotic but very trippy parade of didg, chants, sax, percussion and various other voices, sounds and instrumentation dance about. I'm not surprised to see something about teapots in the song title "Teapot Tectonics" because as the music began I was almost certain I'd hear Daevid Allen start to sing at any moment. It's like Urban Ambience are continuing the story of Zero the Hero in music and sound, but rather than being a total Gong knockoff Urban Ambience make their own individual mark on the music. Mucho freaky space electronics. "Peking Duck (with Mallards towards None)" is a blend of syncopated Tangerine Dreamy keyboards, drifting saxophone, and a freaked out banquet of efx'd duck quacks. It's a hell of an effect with some fun tape manipulations, making for a mucho cosmically strange tune. But with the short "Naked Truth" we start to get more firmly into pure sound exploration and manipulation. "Twothoncentric" consists of ambient drift, darting electro efx, meditative flute lines, busy but non-intrusive clattering percussion, and a single rhythmic pattern that keeps the pace. When the sax joins in it lends a cool jazz groove to the music, and along with the spacey alien bits I half expected the Arkestra to start singing the traveling the spaceways together song. It's ambient, hypnotic, space jazzy, and gorgeously strange. "Percussion Discussion" is kind of an experimental tape splicing party with the Residents. I dig the oddball glom of Vas Deferens Organization styled sounds and efx'd voices, and the Frippoid guitar lines are a nice touch too. "The Joint Suite" and "Jam On The Living Room Floor" continue in this mode with their lysergic feel, Revolution #9 redux craziness, completely spaced out vibe, and bits of dancey cocktail lounge cool jazz. Finally, "Electric Evening Prayer" is probably the calmest track of the set, but with just as many freaky sounds as the rest of the album. There's really so much happening on these tracks that new treasures are revealed with each subsequent listen. With The ENDorphinS Justify The MEANderingS, we once again have that freaky psychedelic blend of sound collage and jazzy touches (some of which gets fairly deep into free-jazz territory), and this album is even more in the experimental realm than much of the music on Exiles In Limbo, though the space factor is still HIGH. The focus is definitely more on avant-garde sound constructions and a mixture of atmospherics and considered chaos. It didn't at all surprise me to read in the liner notes that the group is influenced by such artists as Brian Eno, Miles Davis, John Cage and the Art Bears. 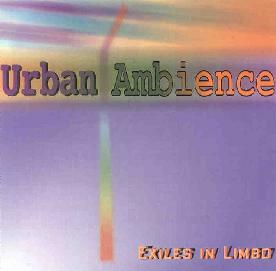 What makes Urban Ambience such a delightful listen is their ability to incorporate elements of all these influences into a pastiche of sound and musical styles that will challenge the listener and offer rich rewards for multiple visits. ENDophinS is a far more challenging listen than Exiles and will probably appeal more to the avant-garde crowd, whereas Exiles, though equally adventurous, is more accessible. Personally I think the two albums make a great pair and I'm glad Michael Bloom shared both instead of only sending the most recent. There are more tracks on ENDorphinS and several shorter ones. But among the highlights is "Cops And Waterpots", which is far calmer and purely ambient than most of the music on either disc. We've got harp sounding strings, percussion, bells, sirens, eerie ooo-weee-ooo Twilight Zone efx, and plenty more. The two brief :A: Train tracks certainly bring the urban aspect of the band to the forefront. "I Love The Winner In Me" features lo-fi and somewhat dissonant guitars and bubbling UFO electronics that form the backdrop for Laura Ludwig's Beat styled spoken word. Laura's narratives go well with the Urban Ambience vibe so I was glad to hear her return on "Berries From The Untermensch", yet another welcome drifting ambient jazzy tune. I love the saxophone and spacey synth blend on "The Evil Twins". The layers of horns and cosmically weird sounds multiply as the track progresses, culminating in something of a freaks parade of strangeness and fun. "Non-Violence" includes guests the Tall Bald Grandfathers who provide a mixture of seriously trippy psych-jazz and Jefferson Airplane with a vocalist that sounds like Grace Slick gone Beat poet (if you can imagine that), along with voice samples of Martin Luther King Jr (I'm assuming that's who it is). Exiles In Limbo had a track called "Twothoncentric" and now we've got "Threethoncentric", an 11 minute jazz in space exploration that brings to mind some of Sun Ra's trippier moments. Love that flute/percussion/UFO blend! Cosmic and totally freaky!! My favorite track of the set. To cap things off we get Eugene Chadbourne guesting on two tracks, though interestingly it's on piano rather than guitar. And finally, like Exiles In Limbo, The ENDorphinS Justify The MEANderingS closes with "Electric Evening Prayer", this rendition being a bit more aggressive than the earlier version. In summary, well... hell... there's quite a lot happening on these two albums. Both discs are highly recommended to fans of avant-garde sound journeys with a space jazzy edge. Everyone else who is intrigued by what I've described should start with Exiles In Limbo. For more information you can email Urban Ambience at netsqueech@attbi.com. Visit the Urban Ambience web site at: http://www.people.fas.harvard.edu/~andronic/UAHomePage.html.